Sorry, I couldn't resist, so many "thorny things" popped into my head, hahaha! What an outstanding name for a dog! Original and with the right amount of syllables lol, seriously. 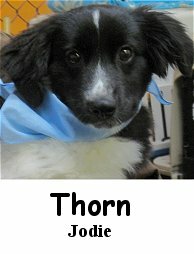 Meet Thorn, he is a super-striking, four month old, sixteen pound, Miniature Australian Shepherd. Now, Thorn may have gotten off to a rough start in life (Puppy-Mill Rescue), but his new owners are doing their very best to help move him forward. Thorn was not properly socialized with humans. Everyone involved with him, including, awesome Dog Trainer Garrett Stevens, is trying to help him gain more confidence. Especially confidence in us humans. So, with that said, he is not sure what to make of most strangers. David worked with him some this morning, encouraging him to relax and enjoy some "comfort touch" before the other dogs arrived at The Fort. With canines, Thorn is much different. He seemed to be at home in the Medium Roll and interacted with a few other canines occasionally. We believe, with time and proper consistency, Dog Daycare will help Thorn transition his socialization skills towards improvement. A Dog Named Faith / Get ready for the 4th! Snuggling Sleepers and Novel News! Pancho and Lady join the pack! Charlotte and Dixie--New Pups at the Fort! A Heaping Helping of Doggie News! Tearin it up at The Fort!